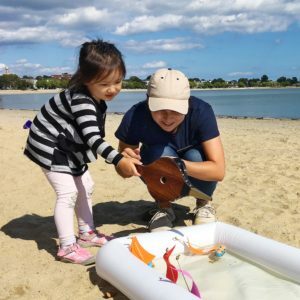 We recently helped young Maya learn about what it means for our harbor to have more storms that bring waves across our Harborwalk, beaches, and waterfront communities. Intrigued, Maya set her miniature sailboat in our small pool and blew as hard as she could to move it across the water. Maya had so much fun, she returned with her family the next week for Free Ferry Day on their way to the Boston Harbor Islands National and State Park. Today, you can help a child like Maya. Our goal is to raise $35,000 to help expand opportunities for your neighbors like Maya. For example, we hope to offer 3 additional community cruises next year to bring 3,600 more people to Boston Harbor who might not otherwise be able to go. Help reach our $35,000 goal by December 31st and expand programs to connect more communities with our harbor. We are counting on you.